Dagenais, Maxime and Severine Craig. "Arrowhead Sash". The Canadian Encyclopedia, 11 August 2016, Historica Canada. https://www.thecanadianencyclopedia.ca/en/article/arrowhead-sash. Accessed 23 April 2019. Stored within the collections of several American and Canadian museums — including the University of Pennsylvania Museum of Archaeology and Anthropology, the Smithsonian Institution, the McCord Museum and the Canadian Museum of History — are a series of woven sashes. 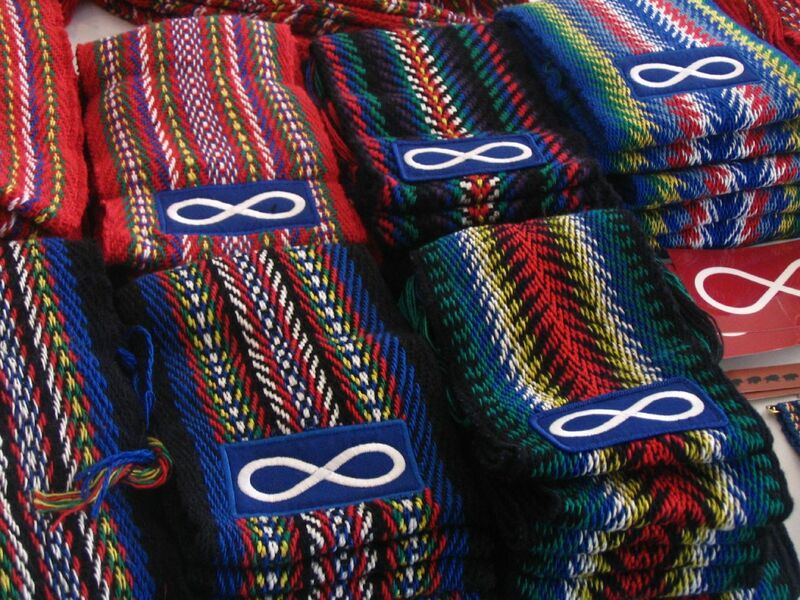 Traditionally made of wool and intricately finger-woven into a colourful lengthwise “zigzag” pattern, they have numerous names, including “arrowhead,” “Indian,” “Métis” and “voyageur” sashes. While some museums list them as “Indian,” “Oneida” or “Iroquois” artifacts — such as Harvard’s Peabody Museum of Archaeology and Ethnology, the Division of Anthropology at the American Museum of Natural History and the Smithsonian Institution — the origins and ownership of arrowhead sashes are fiercely contested, as various communities claim them as their own. To French Canadians, for example, these sashes, known as ceinture fléchée, have become a major part of their cultural heritage and national identity. Along with the red toque (hat) and the capote (long coat), arrowhead sashes are an essential component of traditional French Canadian clothing. Though some museums (especially in the United States) still list these artifacts as Indigenous or Métis, research suggests that arrowhead sashes were first worn by French Canadians by the 1770s, at the very latest. 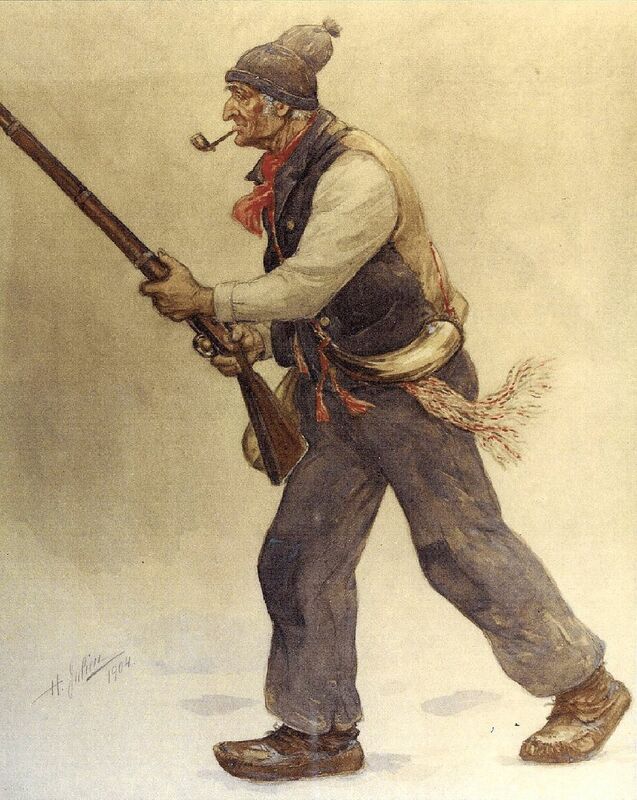 Resulting from the syncretism of French and Indigenous finger-weaving techniques, French Canadians first fashioned these belts for a utilitarian purpose: to stay warm. As French-speaking voyageurs travelled throughout North America during the fur trade era, arrowhead sashes found their way into the hands of First Nations and Métis peoples, who then adapted their own version of the sash and made their own (several of which also found their way into North American museums). Interestingly, museums have been at the centre of this misinterpretation and one of the main causes of their complicated and debated identity. Three communities claim these sashes as their own. To French Canadians, these sashes initially satisfied a practical need. Historians François Simard and Louis-Pascal Rousseau explained that the sashes were first used during the long, cold Canadian winters to tie winter coats. This helped to maximize heat retention. Arrowhead sashes also prevented injuries and hernias for manual labourers and voyageurs as they acted as ergonomic back belts. Though useful, there is no doubt that they were a valued status symbol. 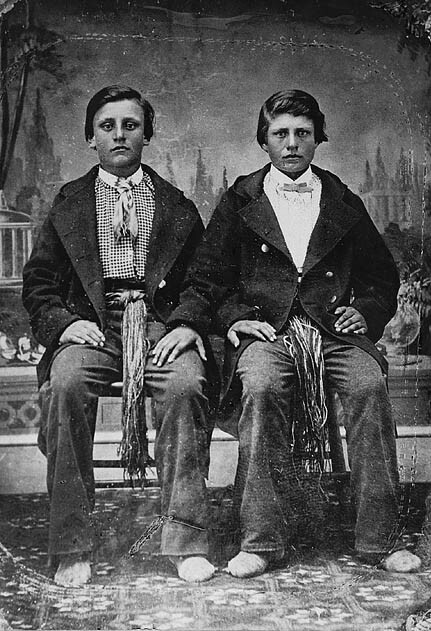 French Canadians could have easily purchased cheaper, colourless belts to tie their coats, but instead many chose highly decorated, labour-intensive and expensive ones. They were an important symbol of social prestige, a way to distinguish oneself from peers. 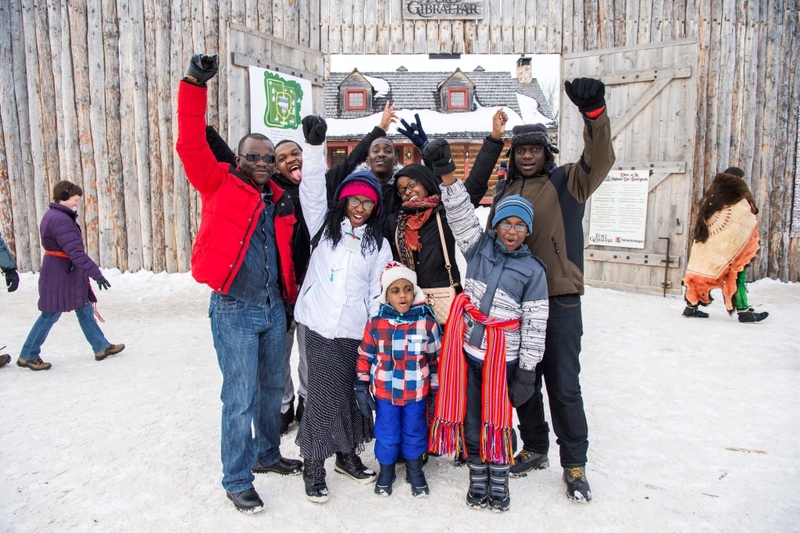 In time, they became an important part of French Canadian identity. When Henri Julien painted an arrowhead sash on his famous illustration of a Patriote (Le Vieux de 1837) in the early 20th century, the sash was forever linked with French Canadian nationalism. For Indigenous peoples, arrowhead sashes also became an important symbol of social prestige. Simard and Rousseau explained that when French Canadian voyageurs traded with First Nations, the traders wore their very best outfits — including the sash — which exuded prestige and authority. In time, Indigenous peoples also adopted the sash via trade with fur-trading companies. This conveyed a sense of equality between the two trading partners. Adding to the fact that finger-weaving was a well-known Indigenous technique, arrowhead sashes were eventually claimed by museums as Indigenous artifacts. To the Red River Métis, arrowhead sashes were (and are) an important part of their history, identity and attire. Similar to French Canadians, the sash became an important symbol of their nationalism, identity and resistance (see 1870 Red River Rebellion and 1885 North-West Rebellion), as Louis Riel was often depicted wearing one. 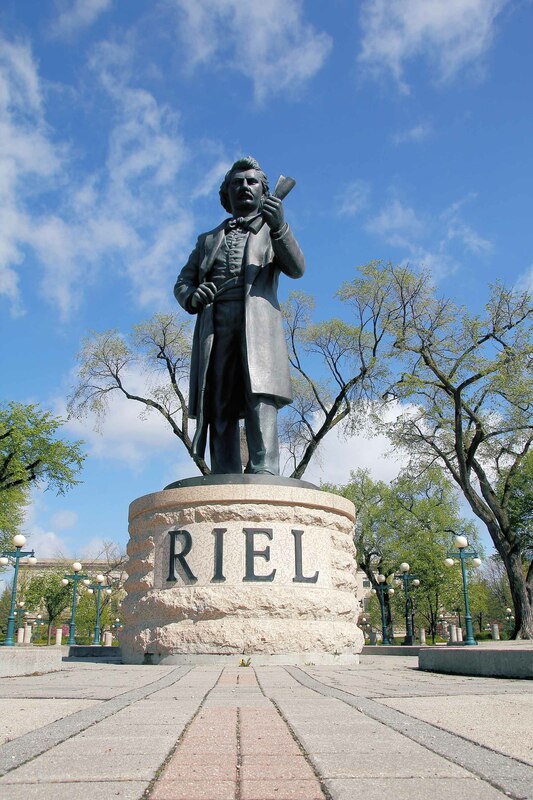 Riel’s statue in downtown Winnipeg, for example, includes an arrowhead sash. 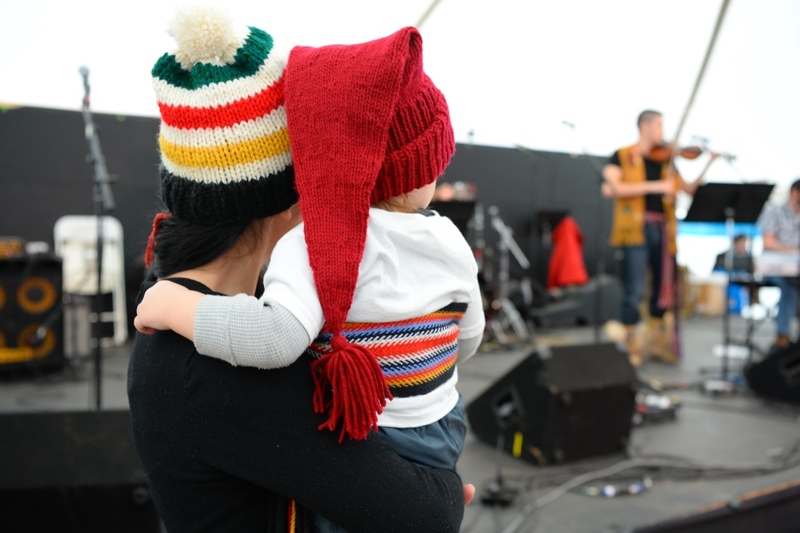 These sashes are also a staple of the Festival du Voyageur and of any present-day Métis political or cultural gathering. In 1996, ethnohistorian Monique Genest LeBlanc — at the time a doctoral candidate in history at Université Laval — sought to get to the bottom of this question: who fashioned and wore the first arrowhead sash? 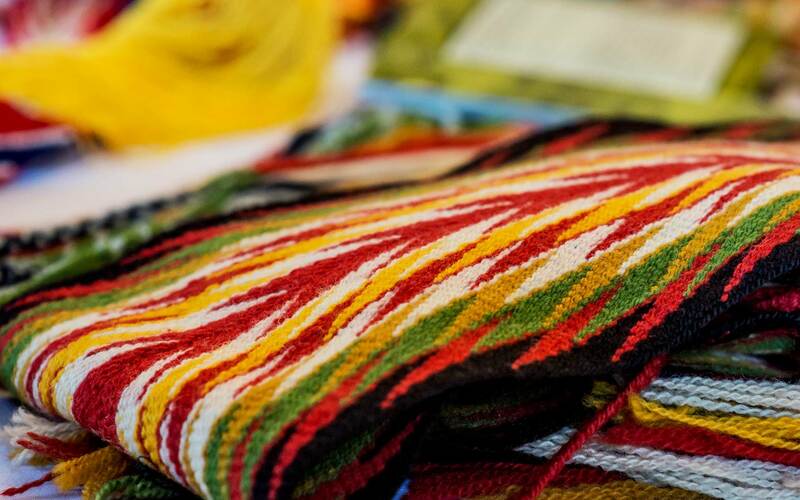 Though determining the exact date when they were first fashioned remains difficult, Genest LeBlanc found that they were initially worn by French Canadians by the end of the 1770s at the latest, when several foreign visitors mentioned colourful, woollen belts in their journals and letters. The first record of the sash was in 1776, when Thomas Anbury, a British traveller, noted that French Canadians wore wool belts to tie their coats in the winter. A year later, during the American Revolution, German and Swiss mercenaries stationed in Canada noted the practices of local peasantry. In November 1777, one soldier explained that French Canadians wore a “thick wool sash with braided fringes.” In the same year, the wife of German Major General Friedrich A. Von Riedesel, Charlotte Luise, noted in her journal that her husband wore “a blanket coat or gown with…the usual blue and red fringes, in the Canadian fashion.” By the late 1790s and early 1800s, mentions of sashes or wool belts with fringes were extremely common when describing French Canadian winter attire. Arrowhead sashes appear later with Indigenous peoples and the Métis. In fact, Anbury and other early visitors who encountered Indigenous peoples failed to mention the sashes in their descriptions of their attire. For Genest LeBlanc, their absence makes perfect sense: since sashes were a utilitarian creation first — to keep French colonists warm in the winter — First Nations did not need them because they already had furs and their own methods of keeping warm. Indigenous people, according to Genest LeBlanc’s archival research, first adopted them in the early 19th century, and even later fashioned their own; Genest LeBlanc noted that some of the pieces that she found in museums were fashioned by Indigenous people. They became such a popular item that fur trading companies, including the Hudson’s Bay Company, began mass producing them for trade with First Nations. They became, therefore, a prized item of social prestige. As for the Métis,they adopted several traditions from both Indigenous and French Canadian cultures, including the arrowhead sash. Though some inherited their sashes from their French Canadian voyageur fathers, many earned them when they became voyageurs themselves. Museums at the Centre of Debates? If sashes are of French Canadian origin, why do museums consistently refer to them as Indigenous artifacts? According to Simard and Rousseau, arrowhead sashes are the product of “cultural syncretism” — the melding of cultures typical in Lower Canada — a process by which the same cultural objects and practices are adopted and claimed by several distinct communities and groups. And the arrowhead sash is a perfect example of this cultural syncretism: a belt made by French Canadians to answer a utilitarian need, but influenced by French and Indigenous finger-weaving techniques. With three groups claiming these sashes, it was therefore very difficult for museums to properly identify their origins. As a result, museums simply named them after the groups they acquired them from. This confusion even prevailed in French Canada, where the Château Ramezay in Montréal and the Musée des Ursulines in Québec City called them “Métis” and “Indian” sashes. Though some museums, like the Canadian Museum of History in Ottawa and the Manitoba Museum in Winnipeg, started referring to arrowhead sashes as ceintures flechées and of French Canadian origin, several museums, especially in the United States, still widely attribute these belts to Indigenous communities. Association des artisans de ceinture fléchée de Lanaudière, Histoire et origines de la ceinture fléchée traditionnelle dite de l'Assomption (1994). Marius Barbeau, Assomption Sash (1937). Monique Genest LeBlanc, Introduction de la ceinture fléchée chez les Amérindiens: création d’un symbole de statut social (1996); “Une jolie cinture à flesche”:sa présence au Bas-Canada, son cheminement vers l'Ouest, son introduction chez les Amérindiens (2003) and “Assomption Sash,” Encyclopedia of French Cultural Heritage in North America. François Simard and Louis-Pascal Rousseau, “La ceinture fléchée au carrefour des convoitises des communautés canadiennes-françaises, amérindiennes et métisses du Canada,” Material History Review 59 (Spring 2004).